The Debrief tab’s Timeline has been part of CloudAhoy for a long time; it lets you control the aircraft’s position, view the aircraft parameters at any time during the flight, and control animation. Until now the Timeline was part of the left panel. Many users have asked to be able to view the Timeline when the left panel is closed. So – we moved it, as seen on the screenshot above; most of it is now permanently at the bottom of the screen, and the 3D viewing controls are on the top-right. 1 Drag the slider and move the aircraft’s location. As you do that, the flight time is displayed in three different formats: the local time, the time after departure, and the zulu time. If one or more flight profiles are displayed, the slider also moves a crosshair on the profiles. 2 On Windows and Mac computer in 3D display mode, select between Pickets and Cockpit view mode. “Pause” mode – the aircraft’s location can be moved manually, using the slider, or using fine control with the -10s, -1s, +1s and +10s buttons. “Play” mode – the aircraft moves at selectable speeds, from 1x to 10x. 4 See the aircraft’s parameters’ display update as the aircraft’s location changes. In “Pause” mode, you can select side or top view, and can rotate 90° right or left. The buttons control the viewing of the currently selected segment. 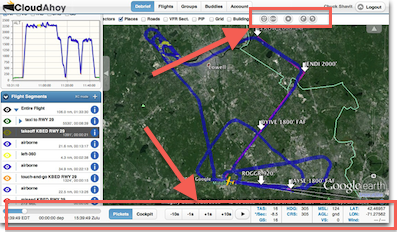 For example, if you selected the takeoff segment, the buttons will show it to you from different angles. In cockpit mode, you can select your viewing angle. You can look forward (“12 o’clock”), or look to the side at any desirable angle. For example, we think it’s fun to look at your 6 o’clock as you takeoff – give it a try! You can also look at any angle up or down. The “H” button resets your looking straight at the current aircraft’s heading and attitude. The “C” button looks into the aircraft’s course rather than heading. As always, your opinion is very important. Let us know what you think of this change! Know what would be neat??? Having a ‘see thru’ HUD in Cockpit View that shows Heading, TAS, and Alt. (MSL or AGL)! !